Hello CTK friends! 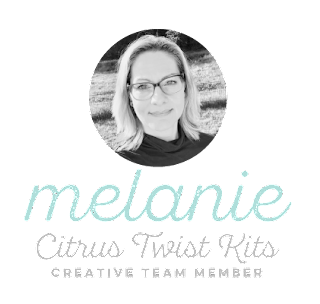 I am so excited to be with you today sharing a little inspiration with December 2018 "Pleasant Valley" Pocket Life Kit. Last week we took a lot of bright winter photos . The title of the white letters will be just perfect for such photos. I cut snowflakes and letters out of thin foam rubber ( foamiran) using my Silhouette Cameo. Added color accents with colorful letters of the puffy alphabet. I also added a few pieces of Ephemera.The card with the yellow hat is just made for my son's yellow jacket. Thank you for everyone's support of Citrus Twist Kits in 2018 and from all of us here at Citrus Twist Kits, we want to wish you a very Happy New Year! Hi Citrus Twist Kit Friends! It's Sunday, and that can only mean one thing - let's get our sketch on!!! Amanda here, & I just love the Sunday Sketch challenge! Such a fun & relaxing way to start off the week! Isn't this a cool layout design?! Oh, what a cutie! Such a lovely Christmas moment documented! 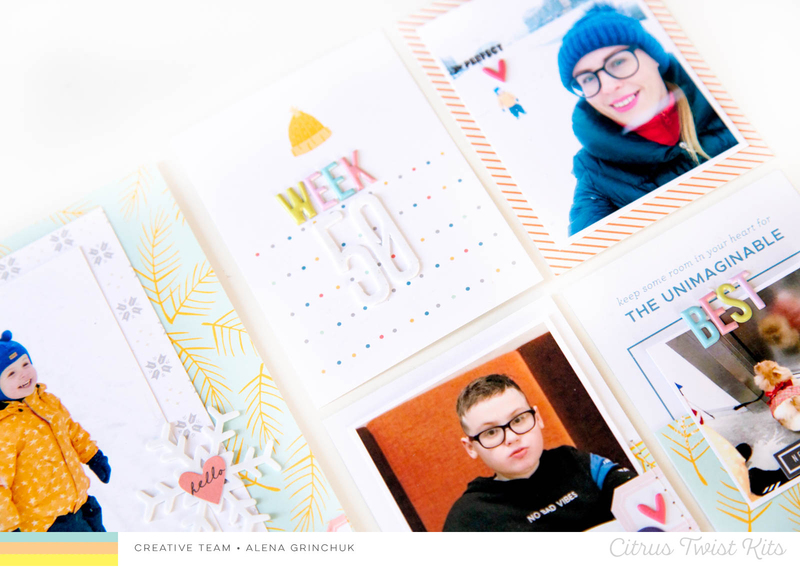 CTK Supplies | Pleasant Valley Pocket Life Kit, Pattern Paper Kit (Crate Paper Merry Days pattern paper), & the December Embellishment Kit. I have drawn on the colors in my darling photograph, and created a Christmas layout with no actual Christmas supplies. 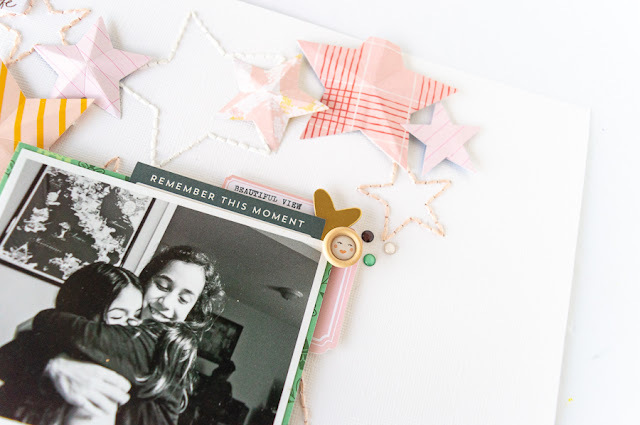 For this to be successful, I use a crisp white, mint and red color scheme, as well as puffy sticker stars and a reindeer die cut embellishment. Combined with my Christmas photo, it totally works! I have pretty much kept to the sketch design, only giving it a little Happy Arty Days twist! There are so many beautiful details here! 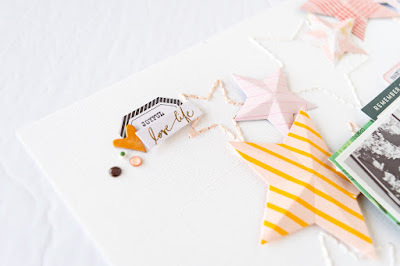 From lovely layers to sweet embellishments - the Pleasant Valley Pocket Life Kit is really something! Loving the Puffy Sticker title, and those layered tags! 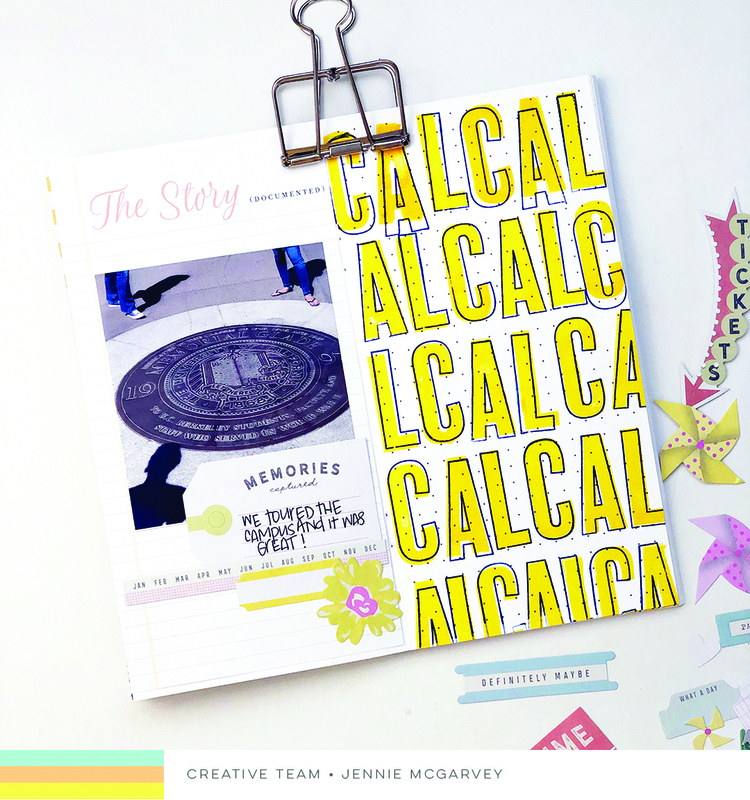 I used those fabulous printed label stickers as my journaling, and the die cut hearts in place of the banner at the top of the page. Perfect! Simple. Sweet. Sketch complete! Now it's your turn! What will you create with this week's sketch? Be sure to share your creating with us in the Facebook Citrus Twist Kits Fan Page HERE - we love seeing everything you make, & love to talk paper too! 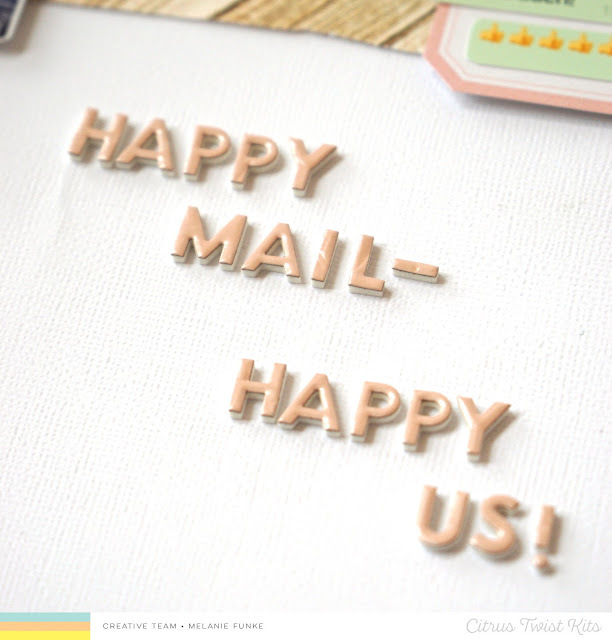 Hey crafty friends, Melanie here with another three to inspire post for you. For my layout I used the Main Kit only and I really love the patterned paper in the kit this month. So I made strips of different papers by tearing them and put them on top of my white background. For more texture I sewed along each strip with my sewing machine. I saved a WhatsApp conversation we had with our niece about a package we had sent to her about 8 weeks ago and she finally received. We were all so very happy about it. I printed it out, cut it apart and put it on top of the labels from the Heidi Swapp sticker sheet. For more dimension I used foam adhesive to glue the labels on my paper. 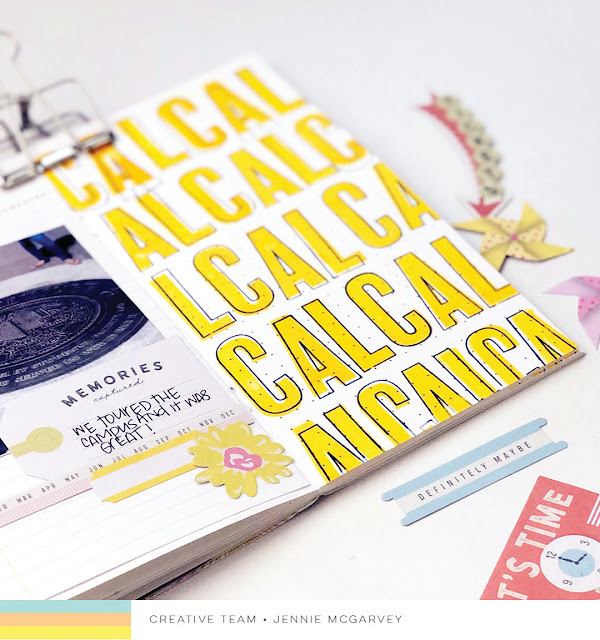 I also used a label for my journaling and placed it on the bottom of my page along with some paper strips. My title went between the top and bottom stripes and I used the wonderful puffy alphas from the kit. I love the colored ones too, but for this page I went with the golden ones because there is so much pattern and color going on already. I hope I inspired you to make a page by using my three to inspire. 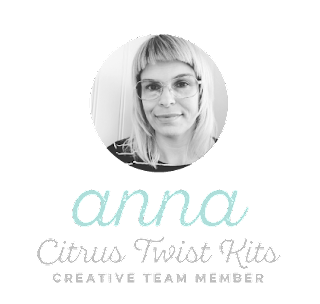 Don't forget to share your creations in our Facebook Group and on Instagram using the hashtag #citrustwistkits. It's my premiere to host this happy challenge Travelers Notebook Challenge. I love creating in this format for a change to my usual layouts. So I've had a blast while creating this one and I hope you will like it as well. 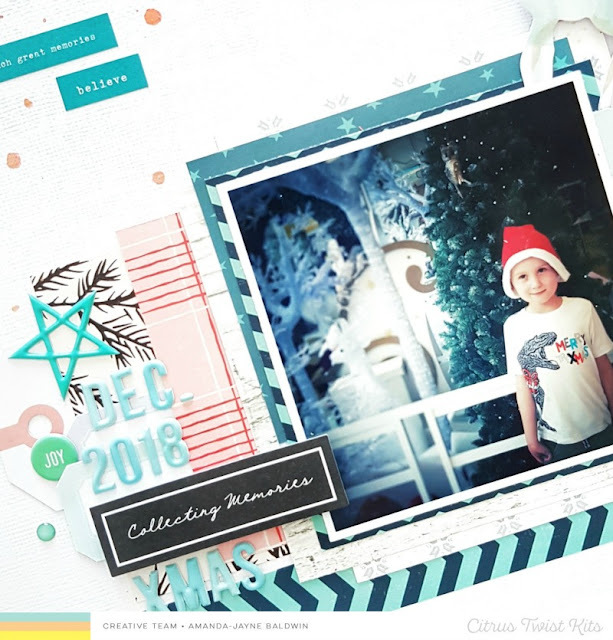 And my challenge for you this time: Use any of our digital files on your spread (digital cutfile or printables) I've used one of the beautiful cut files, the Winter Snowflake, as my focal point on my spread. 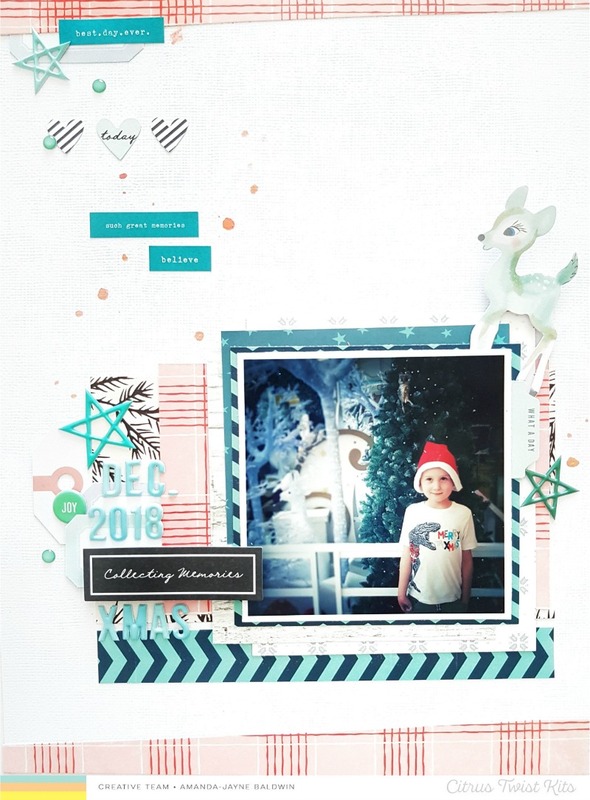 Here's what I came up with using bits and pieces from the December Scrapbook kit, Pattern Paper Play kit and the Pocket Life kit as well. One of my favorite from the CTK exclusive die-cut ephmeras (Pocket Life kit) is that cute little bambi and of course these puffy stickers as well. The cut file is just amazing too, it worked just perfect for my wintery skating pic. Also I did add some machine stitching. I love the texture it brings to my design. Those classy black labels are also a winner. All the CTK exclusives are always something extra, yum! Remember to share with us what you create with this challenge either on social media using @citrustwistkits or #citrustwistkits or on CTK friends page on Facebook. I cannot wait how you interprete the challenge. 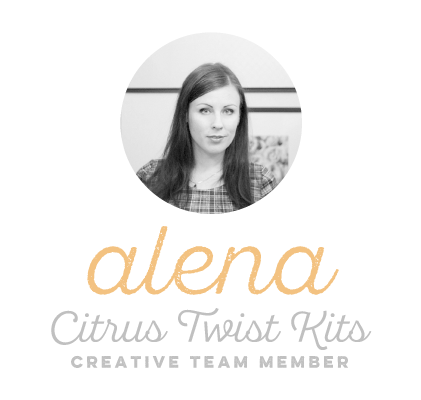 Hey Citrus Twist fans! 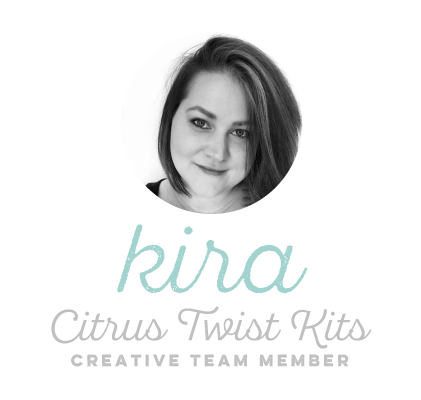 It's Kira and I am back with another 8.5x11 layout using a mix of the December kits. 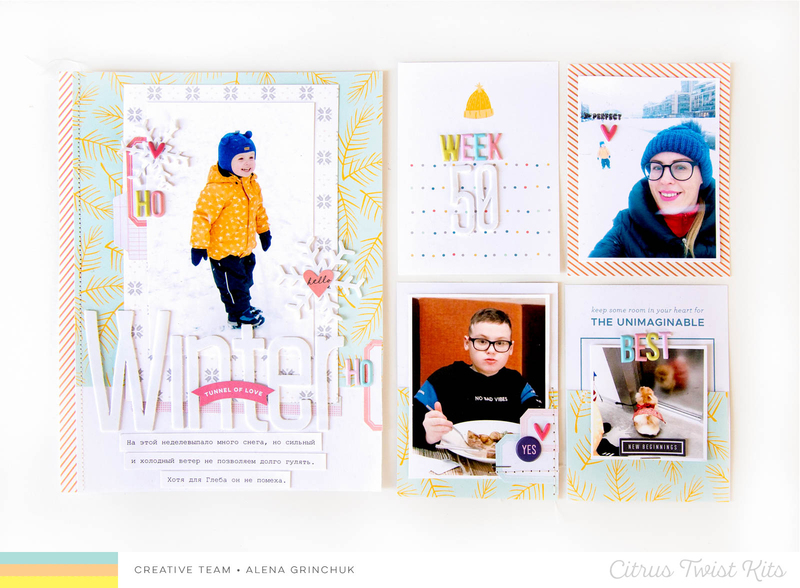 Have you checked out the exclusive cut files for the month? I was immediately drawn towards the poinsettia cut file. I knew it would be perfect for this conversation my son and I had about Santa. I started by cutting the cut file fairly large from white cardstock. When I cut it, I thought I might cut up the cut file slightly, but didn't have much of a plan until I actually got it cut out. I backed it with papers from the main kit and the pocket life kit. After it was backed, I decided to cut some of the leaves and other decorative elements off, leaving just the large poinsettia. 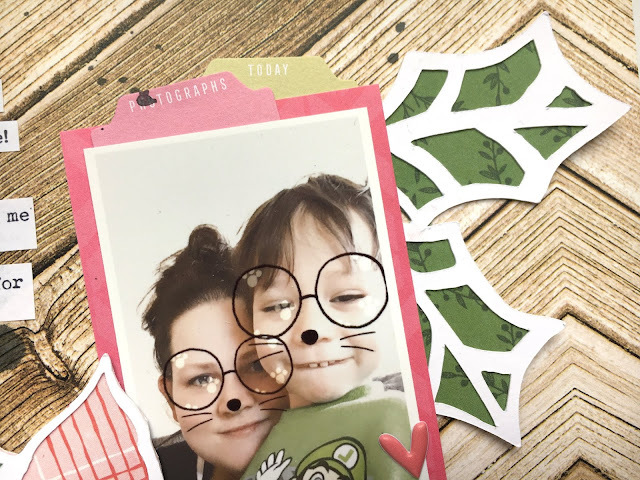 The photo I used for this page is a filtered selfie of my son and I, since the "story" on this page is a conversation him and I had as Christmas was approaching. I backed the photo with the "Confetti" paper included in the add on kit. 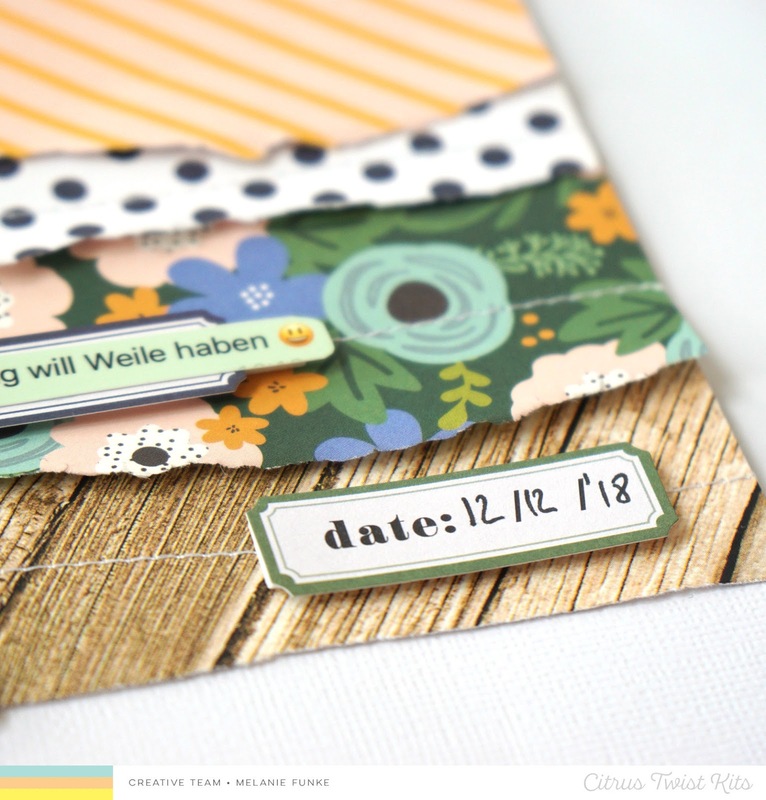 Then I tucked a couple of tabs from the PL die cut pack on top of the photo. I decided to use the wood grain side of the "Harrison" paper (included in the main kit) as my background. I placed my poinsettia in the lower left corner and sort of nestled my photo into the flower. I used some of the leaves I had cut from the cut file, underneath my photo. The title was perfect for this story! 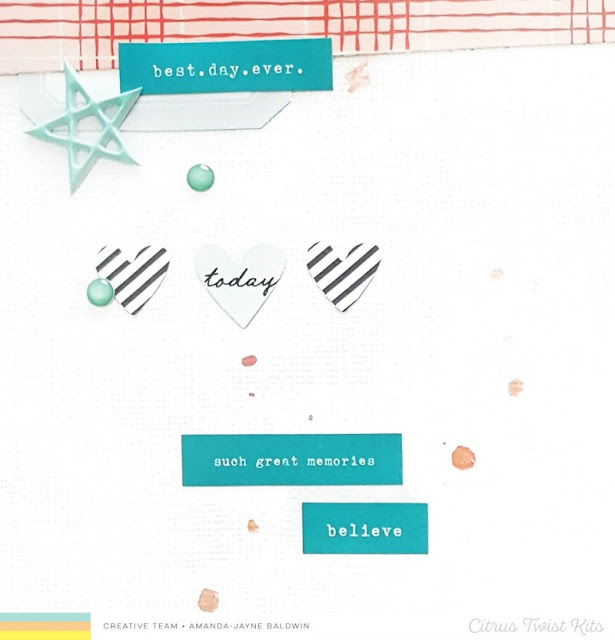 I used the word "believe" from the Shimelle thickers included in the add-on kit. 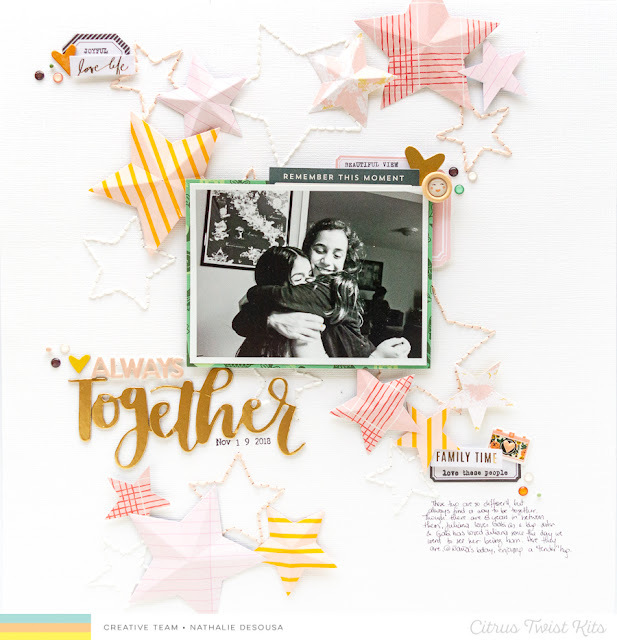 I finished off the layout with some embellishment clusters in the upper left and bottom right clusters. I added some typed journaling strips and black splatters and called the page done. I can't wait to see how you plan to use the cut files this month! Hey there, lovelies! 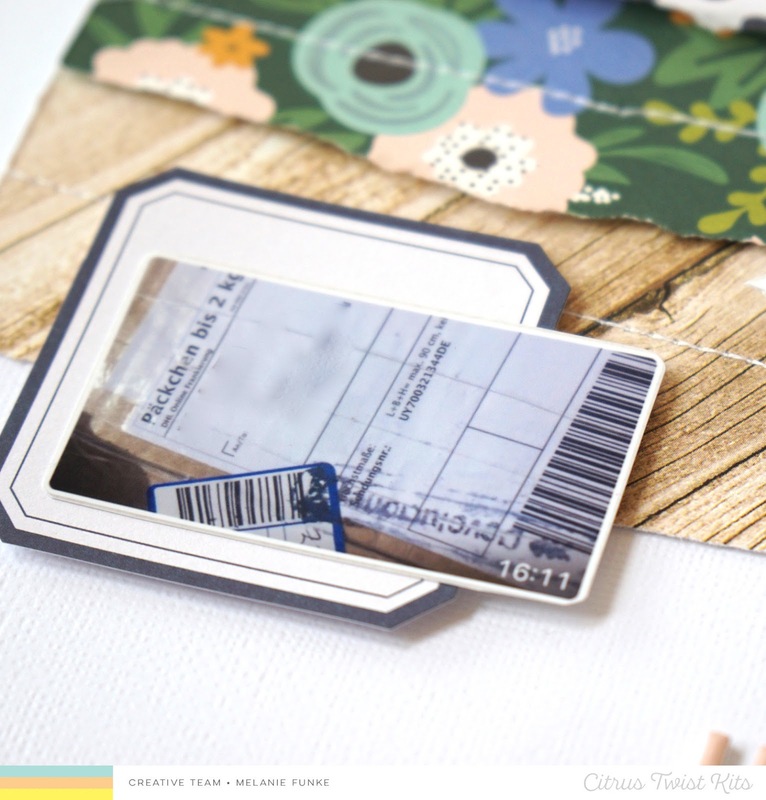 Cece here and today I'm sharing how I used this month's GraceBox in my Bible. I absolutely love all the elements that came in this month's kit and enjoyed working on this page so much! First, I put down some interest in the background using a stencil I had in my stash. 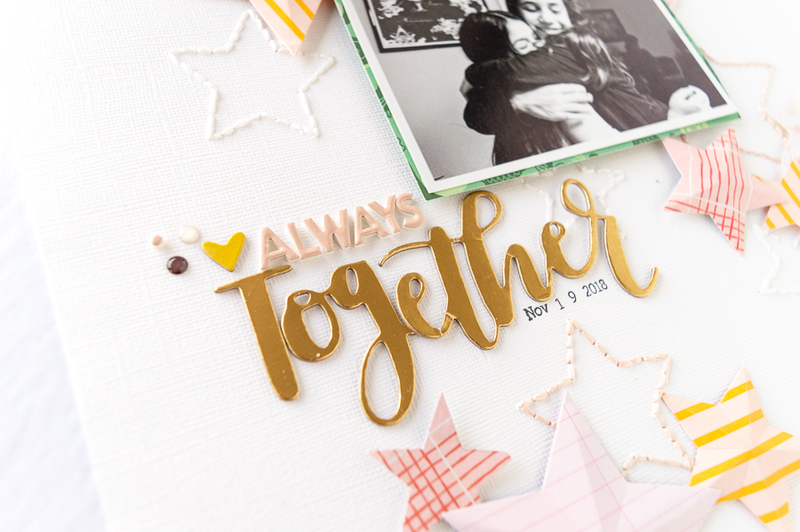 I love using stencils because it's quick, easy, and mess-free. Next, I put down some of the die-cut that came in this month's kit. 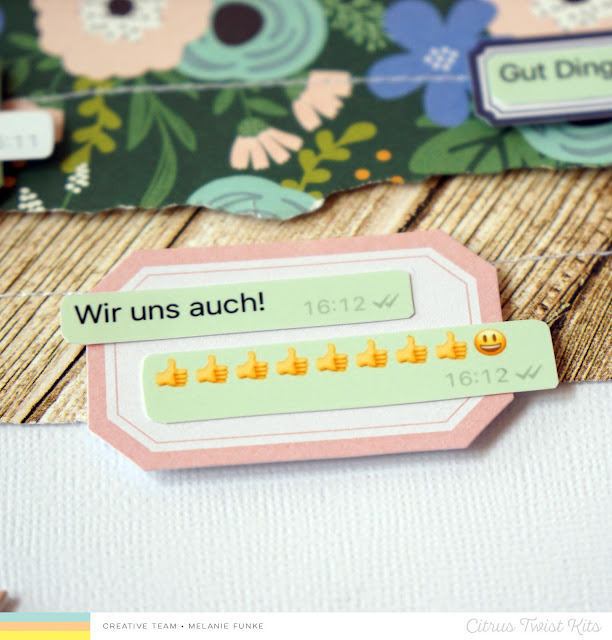 I love all the die-cuts! They're gorgeous. This bird spoke to me and reminded me of the old hymn His Eye Is On The Sparrow. I looked up the lyrics and God spoke to me and reminded me of how much He loves me and will always look out for me and take care of me. So I layered a couple of birds, leaves, and some flowers right in the center and made sure to put some on the edge of the page. Then I used the beautiful alpha stickers to spell out the word SPARROW. Last, I used the fabric strips to make some bow clips to add to the top of my page. Hello and Merry Christmas! I'm hoping you have had a delightful day so far and your family is healthy and happy. Once the festivities are over, you might want to get crafty - maybe ink up some stamps and that is what I'm thinking that I'll be doing! I have a fun and super simple tutorial for you today that I think can really help you personalize all of your projects. The left hand side was kept super simple in order to let the stamping be the highlight. 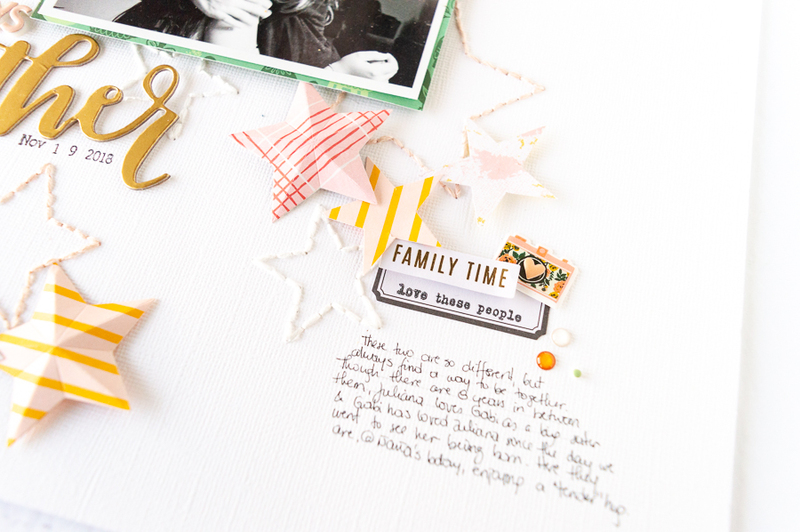 I used a few bits and pieces from the Pleasant Valley Pocket Life Kit and it was the perfect way to put it all together! I love stamping. It's so much fun. 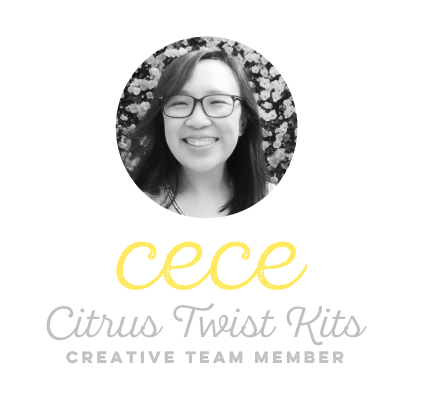 And it's also so easy to personalize your projects. I mean, where else am I going to find something that says CAL over and over again? 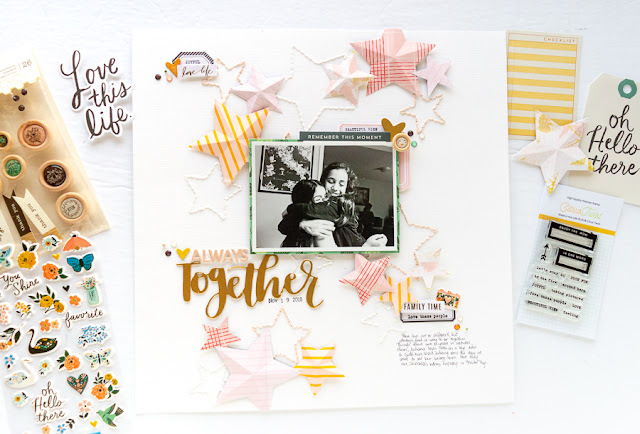 Right here with the Spencer Solid Stamp Set and the Spencer Outline Stamp Set I was able to create exactly what I wanted by repeatedly stamping CAL over and over again. Before you start, there's a couple of things to consider. What colors will you use? 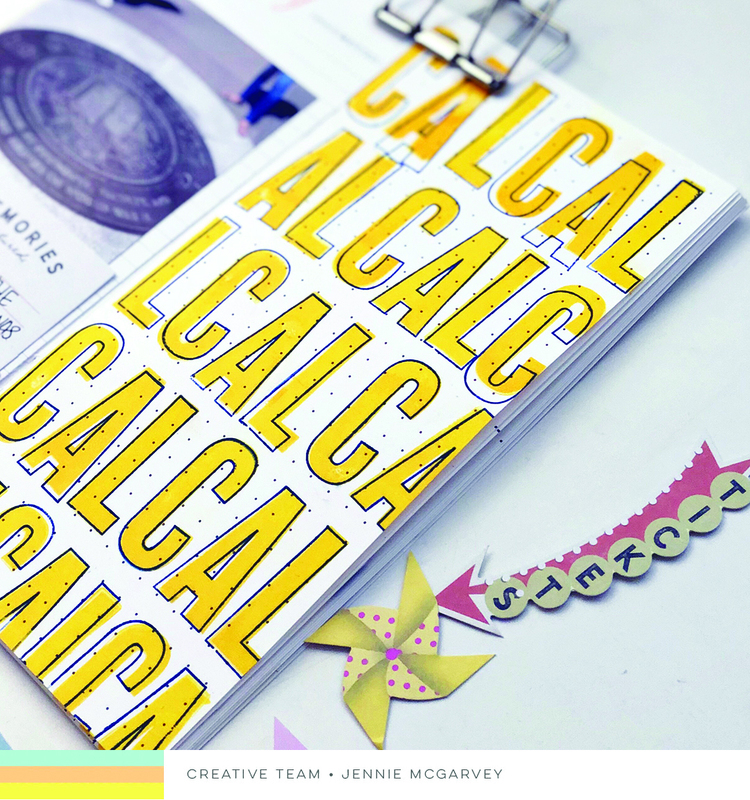 I wanted to use a golden yellow and navy blue -- the colors of Cal [University of California - Berkley]. I also knew that I DID NOT want the stamping to line up perfectly. I wanted it to be slightly and somewhat offset -- all of the letters being a little bit different. Believe it or not, that is how I like this type of stamping best. And these Spencer alphas are PERFECT with this! I also wanted to make sure that each line didn't start the same way as the one before it. So, I had to make sure to keep track of what I had started with on the line previous. I didn't want it to be too contrived or neat - I wanted to keep it casual and random. 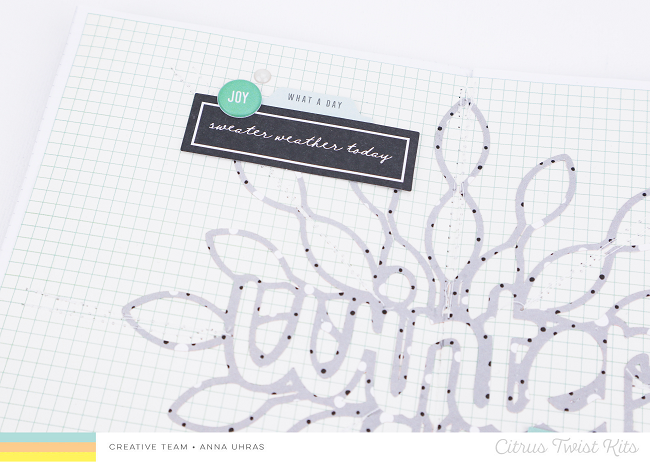 Try stamping out your own designs! Either use them to replace patterned paper or a large cluster of embellishments -- whatever your project calls for! 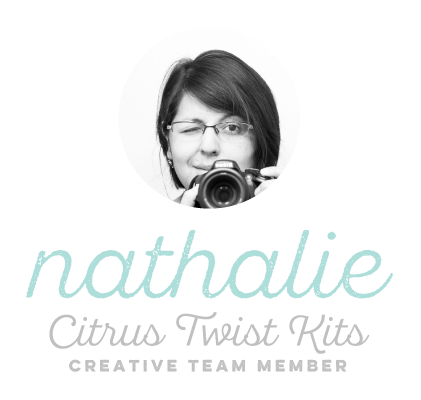 Nathalie with you today to give you some inspiration when it comes to documenting your every day life. I think, some of my favorite memories to document are those of simple gestures or moments that happen in our day, and what better way to do it than with the patterns and colors of the Pleasant Valley kits. 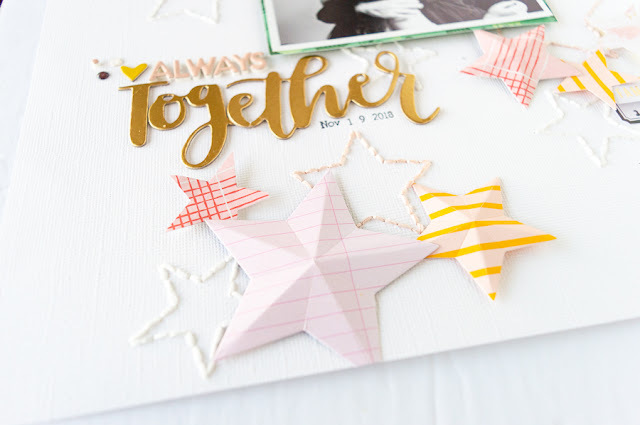 I decided to create a soft girly page with no flowers -that was a major challenge for me!- So, i pulled a folding star die from my stash and cut a few stars from papers from the Pleasant Valley kit, the choice of papers was made so that pink was the main color of the page. The negative pieces from the star die cuts were used to create the stitching pattern on the background on the page. A bit of foam adhesive holds the folded stars in place. 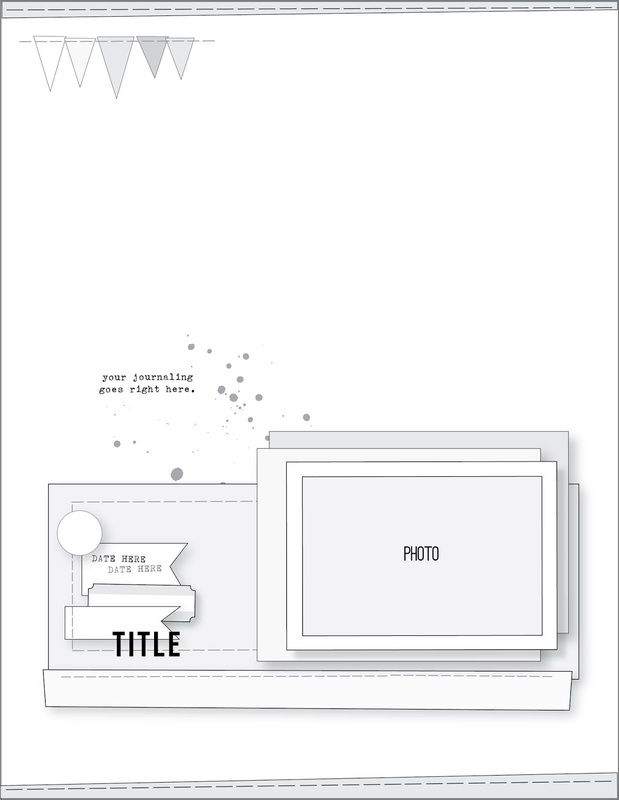 The picture was backed with a paper that contrasted the pink of the stars, and then nestled in the center of the layout. One large cluster of ephemera and stickers from both the main and embellishment kits was added to the picture. Repetition is the key to create a visual triangle on this page. 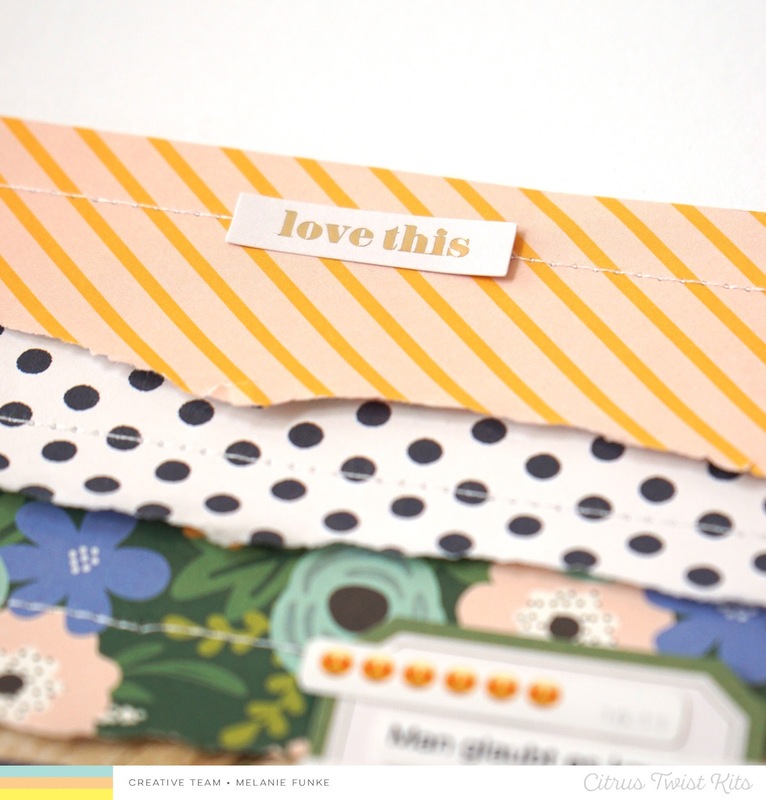 In this case, stickers, hearts, labels, stamps and enamel dots. Love the colors of the Pleasant Valley kits!!!. 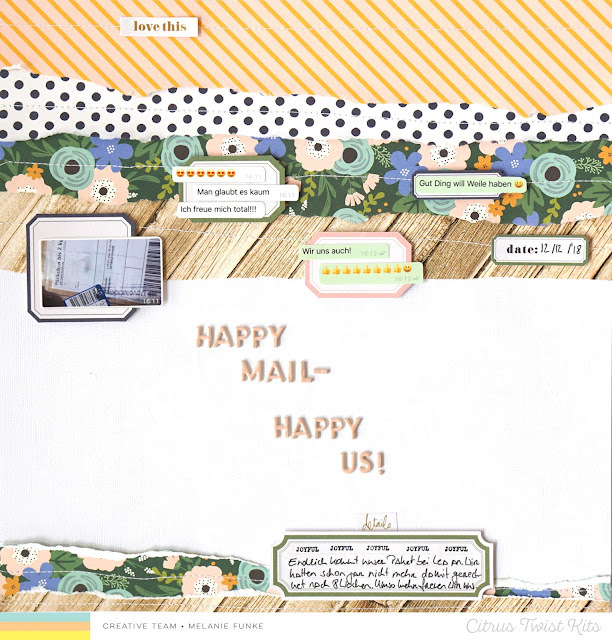 I used a combination of the 1Canoe2 chipboard word stickers and the small puffy Pink Paislee alphas from the Pleasant Valley kits to create the title on the page. I really love how this turned out, and how easy it was to put together. I hope this has inspired you to document your everyday moments using the beautiful PLeasant Valley kits, I cannot wait to see what you create! Before i go, let me wish you a Blessed Christmas, let the peace of the season remain with you through the New Year! 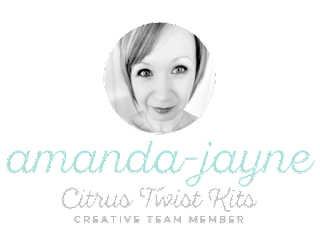 3 To Inspire with Amanda!